DAET, Camarines Norte (Bicol Standard) -- Gov. 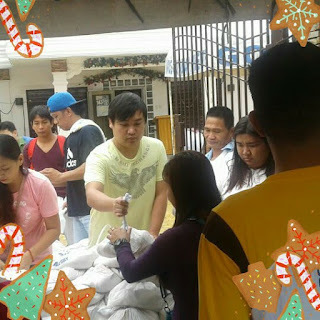 Egay Tallado, along with his son Provincial Administrator Alvin Tallado and wife Josie Tallado brought joy to residents of Jose Panganiban, Capalonga, and Paracale during the holidays this year. Residents of these Tagalog-speaking towns are the recipients of the services of the last leg of the Multi-Services Caravan this 2017. Also present were Vice Gov. Jonah Pimentel and several Board Members. The group of provincial leaders gave out food packs, seeds, medicines, reading glasses, slippers, and tilapia fingerlings, among others. There were also free medical and dental services for the thousands of residents who flocked to the site of the caravan. Gov. Tallado said the local government's flagship public service program continues to be true to its commitment of bringing government services closer to the constituents even during the holiday season. Tallado said he enjoys spending time with the constituents during the holidays because they are already part of his family. He further promised that this project will be continued in the coming year.